Small Tea House Infuser - ideal for cup or mug and for small leaf teas such as black, or Rooibos teas. Has it's own tray to sit on! Very cute and makes a great add in gift with your tea. This stainless steel Tea House is really a very quaint 'must have' infuser. The Tea House comes with its own tray rest to catch the drips and looks great on your desk or kitchen work top. 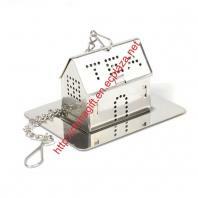 Our company is specialized exporter, manufacturer and supplier of Stainless Steel Tea House Infuser in China.